We've all seen the renders and blueprints, we've all heard the rumors. The iPhone 8 has been leaked to death at this point, but despite that we recently got yet another curious leak regarding the new iPhone, and it came from none other than Apple itself. After the company accidentally pushed an early firmware for its upcoming HomePod smart speaker, swarms of developers and enthusiasts took it upon themselves to scour every line of code in the firmware for interesting info and/or clues about upcoming products. What we got was (seemingly) a confirmation on the iPhone 8 design that we've seen leaked so much recently, as well as info on the phone's face detection capabilities. But that's not all, folks! Curious people over at Reddit have dug up yet another interesting reference in the code, this time around pertaining to the screen size and resolution of the iPhone 8. The iPhone 8 has been long rumored to sport a 5.8” (not accounting for curved corners) OLED display with a non-standard aspect ratio akin to that of the Galaxy S8 and G6 and dimensions very similar to those of the iPhone 7. However, a few of code found in the HomePod firmware may suggest otherwise. Although this sets nothing in stone at this point, it is an interesting find nonetheless. The firmware for Apple's upcoming HomePod contains references for a device with a 3x Retina display with a resolution of 1125 x 2436. Nothing surprising here, as KGI analyst Ming-Chi Kuo predicted this would be the resolution of the new iPhone way back in February. What's interesting, though, is that the line of code also makes a reference to the screen size of the iPhone 8, and it's not what we expected! Instead of the widely-rumored 5.8 inches, the code suggests a substantially larger 6.5-inch display, which would put the iPhone 8 more in line with the iPhone 7 Plus size-wise, instead of the iPhone 7. At this resolution, a 6.5-inch display would have a pixel density of 412 ppi, which is slightly higher than 7 Plus' 401 ppi, and it will supposedly use 3x visual assets, much like the iPhone 6 and newer models. Although this information cannot be taken as definitive, it is interesting to speculate nonetheless. Since Apple will most likely be releasing one iPhone 8 model, which size would you prefer? Something more akin to the iPhone 7 (as widely suggested by rumors) or something more closely resembling the iPhone 7 Plus? Tell us in the comments below! No one is going to buy a big phone. In any case Apple needs to eat some crow. Especially when Apple themselves stated that those higher resolutions on smartphones are a waste of resources, and nobody can see the difference. Yet, nowadays Apple is once again following in Androids footsteps. Except you can see a difference. All one has to do is take an image and crop it to their size display or any standard size display. 720, 1080, 1440, and 3840 and see the differences in quality and texture. When we had nothing better, then were were stuck with what we can get. That is no longer the case. Apple and their stupid none standard resolutions provides no benefit, because then they have to have a software engine in place to make everything line up properly. Job did when he talked about the eyes not seeing pixels aftwr 330PPI. He claimed at a certain distance on such a small screen, your eye coukd tell the difference. But it can. If his claim was true, then you wouldn't notice any difference if 2k vs 4K. 9to5 Mac I believe or you can Google the title of an arrival tbat is a off called, When Retina isnt enough. To be fair, one cannot hold the things Steve Jobs said and did in the name of Apple, against the current, Tim Cook led company. It really feels in many ways like a different company these days, for better or for worse. Steve Jobs was a control freak, and a spiteful child at times, and while at times he was a "visionary", at other times, one felt that he did things the exact opposite of what the competition was doing only just to say his way is better because he had an ego the size of California. Tim Cook is a business man, and he has shown that he is willing to admit when he has been beaten, and adopt the "competing" ideas in order to give the customers what they want, instead of doing whatever he sees fit, and then TELLING the people that this is what they want. Love him or hate him, it takes balls to take over a company like Apple, and then do things completely differently than it would have ever been done under Steve Jobs. Where have you been since 2012? So no one bought the S8+ and no one is gonna buy the Note 8? Nah, AxelFoley was simply quoting Steve Jobs in post #4. He wasn't saying that from himself. 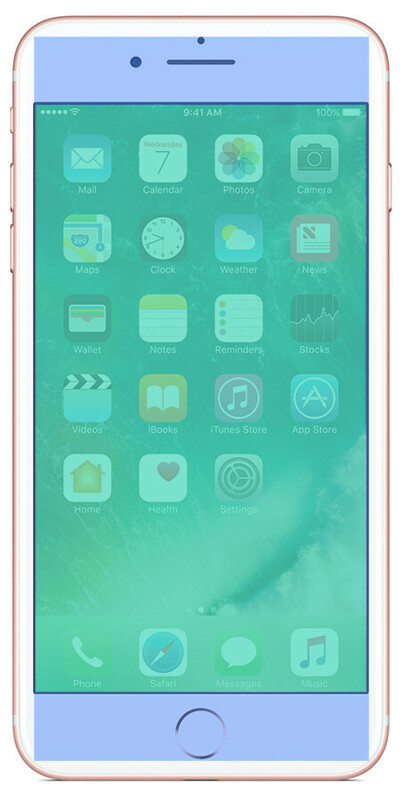 Size of the iPhone 7 Plus will hopefully be reduced. After owning an S8+, I found the iP7+ to be far more difficult to operate with one hand. May I ask is it hard to pull down the notification panel with S8+? Shouldn't be too difficult since you have gestures with the FPS. What Carlitos said. I turned on the gesture that allowed for FPS swiping. Swipe down and you get the notification shade drawn. Swipe up to retract. That being said, this still wasn't the best solution due to the awkward placement of the FPS. However, since the phone is so skinny, 'shimmying' the device to move thumb to the top wasn't difficult. No it's not. You can also activate the fingerprint sensor gestures to pull down the notification tray as well. Should anyone even believe what you say judging by your history of constantly trolling Samsung related articles? Hmmm, with quad speakers, maybe? Good one PA. Let's keep it close to is known so far. This is looking great. Thing will be getting interesting from now on until the announcement. It would be wonderful to have such devices in the Apple lineup. Maybe they'll have two sizes, like the regular and plus. That would be good for the consumer. Only 412ppi? Sorry, but for this price it needs 550 at least. It is a high end phone. No one with an iPhone cares about PPI anymore. Because the iPhone doesn't have the highest PPI since the S4. When it had the highest, that's all the ifans talked about., Now they don;t bring it up because they know its an argument they can't win. That's how fans are. They talk about having the best when it is the best and when its not the best anymore they don't bring it up. Just liek how they do with Single Core benchmarks. Even though OS' are multi-threaded and so are the app, they keep talkign about it. The day Android phones have both a higher single and multi-threaded score, they won't talk about it anymore. Just watch. They are basically band-wagon fans. As long as they are winning in something, they are all on-board. Once they lose that edge, they are off the wagon. Think of all the things on Android they ridiculed because they don't have it, or they had the best at the time: Big phones, high PPI, FPS, high resolution, wireless charging, higher megapixel cameras, fast charging, being able to operate the phone with other input methods like pens or stylus and so much more. Sorry techie but it's often Samsung fans like you that simply put words into iPhone users mouths or try to generalize things. I acknowledge the achievements in the Android world and I acknowledge Apple's achievements. I hope you can do that too and stop try to dominate others by imposing your views on them.